Once there was a fierce and grumpy dragon that dreamed only of leaving his cave and flying away to the brilliantly bright castle in the sky. A castle made of flames and light, where everyone danced with speed and joy. But according to the legends this was only possible if a dragon had a kind master who would jump on its back, and guide it with love. And this dragon was not a pleasant fellow. The dragon read books on how to be kind and gentle, forgiving and understanding, so as to attract the perfect master. It did not take long for potential masters to begin appearing at the mouth of the cave. However the dragon always found something wrong with each of them. “That one is too bossy,” it would say to itself. “And that one is too vain. This one talks too much. Oh, no, this one’s too hairy and that one’s too cold,” and on and on it went. It engulfed each and every one of them with flames. After a few miles of time the dragon had burned to death hundreds of inspiring masters. The dragon could always think up an excuse. Clearly, thinking was the dragon’s trouble. Gossip soon spread throughout the land that the dragon did not really wish to go to the brilliantly bright castle in the sky. So naturally potential masters stopped coming. Before long the dragon grew bored, then angry, then tired and then finally it fell into a deep sleep. It slept so well that it didn’t even think it was sleeping. Life went as it should for a hefty piece of time and soon the fire inside of the dragon began to ebb. To make matters worse that winter was the coldest winter ever. The dragon however knew nothing of the danger it was in. No one dared try to wake it. However as luck would have it, nothing stays the same for too long. A young knight, fresh and noble, had heard of the dragon and decided to see if he could jump on its back and fly away to the brilliantly bright castle in the sky. Many people warned that the dragon was dangerous. They said the young knight would definitely die if he tried to tame the wild dragon. But the young master saw no alternative, as dragons were few in number. All the dragons he had rode on before were too timid or scared and always failed him just at the moment when something needed to be done. He was running out of dragons. But he had to hurry for the dragon’s cave was almost completely covered in snow. Initially the dragon was struck silly with fear and danced only because it didn’t have any time to think, as thinking was the dragon’s chief trouble. But it danced and before long the dragon began to feel giddy with glee. The young master, however was a real master and could easily look into the dragon's head and heart and hear all of its thoughts. “Have you read the book that masters read?” he shouted. But with the master on its back the dragon could not help itself and danced some more. Then it thought, “I am not such a fool as this fool thinks I am.” It realized the master was reading its thoughts. This in itself should have proved to the dragon that this was a real master. But the dragon had the habit of thinking. “What if this master just stole the masters' book and read the chapter on how dragons think? If that is the case, then he isn't a real master at all. I must learn to hide my thoughts from him; for without this simple privacy, I have nothing.” The dragon had read that the only way to do this was to think through a hungry stomach. The dragon hoped that the growling stomach would muffle his thoughts. But in all truth, the master cared little for the dragon's thoughts and commanded the dragon to dance faster and faster. And the more the master ordered, the more the dragon resisted. This only made the master stronger and the dragon tired. The master said nothing; he got off the dragon's back and quietly started to walk away. The dragon chuckled, rolled its eyes and decided to go back to sleep. It went to its favorite corner and curled itself up. The dragon lay for two days but no matter how it tried, it couldn't close its eyes! There was nothing else to do but cover them with its paw. Then it realized it couldn't close its ears! It couldn’t possibly sleep with its ears open. It cover its right ear with its other paw. But this left its left ear wide open! It put its left ear to the ground but this was uncomfortable. Then it found it couldn’t close its nose and there were too many distracting smells keeping it awake. It was impossible to sleep. The dragon was upset for it thought that the master had ruined it. It set out straight away to destroy the master for disturbing its sleep. It didn't have to go far as the master was waiting outside the cave. “You have ruined me! You aren't a real master. I knew all along. Prepare to die,” the dragon shrieked. “You could better answer that, I'm sure. Prepare to die,” the dragon roared. “So you have no wish to go to the castle in the sky?” the master asked. “Maybe there is no such thing. Prepare to die,” the dragon said. The dragon didn’t like be patronized. “You can talk until you die, prepare to die,” the dragon growled. It wasn’t much of a fight. The master was very quick and by this time knew every move the dragon was going to make before it even knew it was going to make it. After a few moments the dragon found the master on its back and guiding it into the air. The dragon fought and kicked and resisted but the master knew what the dragon was going to do and used every move in his favor, soon they were high in the sky. They traveled round the world once just to gain speed. By now the dragon had settled down. But the master did something new and unexpected to rile the dragon, making it feisty and full of energy. Suddenly the dragon realized that that was what was required. Once they had picked up enough speed they roared through the sky and in a flash approached the flaming castle in the sky. It was such a brilliant flame that it burned the dragon's earthly body away so that all that was left was the flame inside him. And it was such a brilliant light that it burned the master's earthly body away, until there was only the light from his eyes left. The next day was the brightest and sunniest day the earth had yet known. For the dragon and the master had a new home in the brilliantly bright castle in the sky, made of light and flames where everyone there danced with even greater speed then before and with so much joy, that it would kill us silly folks way down here on Earth. 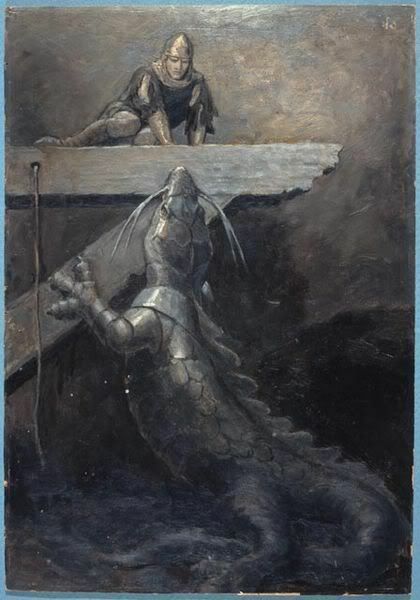 Image: Katherine Pyle, Dragon rearing up to reach medieval knight on ledge. 1932. Troy Morash comes from Canada but has lived and traveled all over the world. He has lived in California, Romania and Russia (the Far East) and Ukraine where he taught English. His stories have appeared in journals and magazines, including Fables, The Rose and Thorn, The Summerset Review, Monkey Bicycle, Eclectica, Bewildering Stories, The Glut, Ken*Again, and others. He has also translated fables from Chechnya and Romania. People enjoy contemplating and being amazed by other realities. This is an expression of hope for something higher, something beyond a mere mundane existence.